Adaaran Select Vadoo is one of the smallest resorts in Maldives however it has an excellent house reef which is teeming with marine life. While you are snorkeling you can aquaint yourself with many types of fish such as Blue fin, Jack fish, Eagle Rays, Baby Sharks, Trumpet Fish, Rudder fish and many more. On the shore of the island you will encounter many endemic species of Wildlife such as the Maldivian Grey Heron, Lizards, and more that thrive there. The Diving School offers a variety of Dive Spots (more than 40 spots), an introductory course, and PADI & NAVI C-card courses for non-card holders. We usually have 5 to 6 dive guides at any time for 31 rooms. 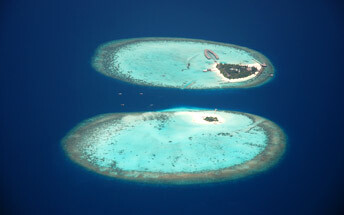 The recreational activities offered are Night Fishing, Dhoni Sailing and Excursions to other islands.